This is another recipe that reminds me of my time spent working on the farm in Sicily. One of the other volunteers working there was a lovely girl from the East Coast, Caroline. She was one of those incredible people who managed to always look so… classy. I would come back from a day of hard work on the farm looking like I’d just been hit by a truck that was probably filled with something really disgusting. She, on the other hand, would come back from a day of hard work on the farm looking like she had just walked off the cover of a magazine. A really classy magazine. Caroline was also an incredible cook, and what I found most impressive was that she could take any ingredients that she had on hand and throw them together into an amazing dish. I really appreciated her rustic style of cooking - everything was fresh and simply seasoned so that the tastes of all the ingredients shone through. She made a grilled vegetable lasagna that I still occasionally dream about. Once, she wanted to make a big batch of homemade pesto, but there was no food processor on the farm. There were also no pine nuts. 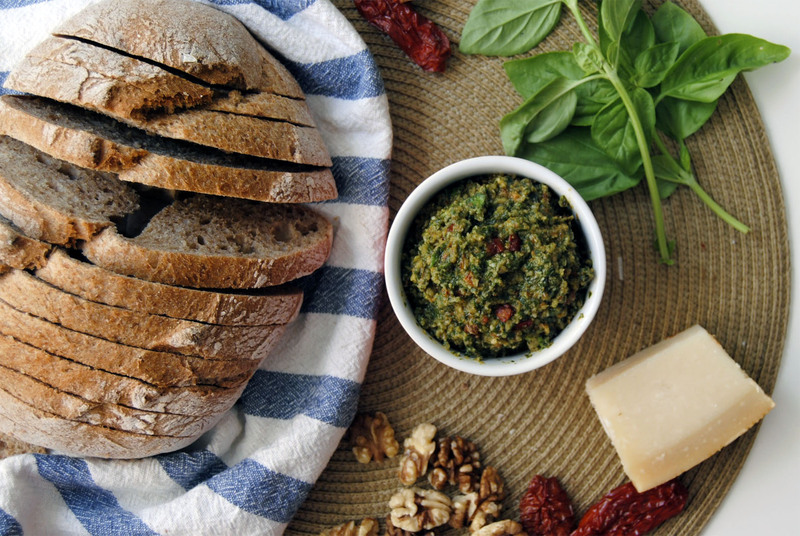 In that situation, I would have just not made pesto, but Caroline was more determined and literally chopped all the ingredients by hand, substituting walnuts (or maybe it was almonds?) for the pine nuts. The result was an amazing spread that I ate nonstop for the next several days – I would slather it on any bread or cracker I could find and if there was no bread around I would just eat it with a spoon. Remember, I was definitely not the classy one on the farm. This is not exactly the same pesto, but it’s my own version and it has a very similar rustic quality to it. However, I used a food processor and I strongly suggest that you do the same because we are not on a farm in Sicily and there are certain luxuries that go along with that. Besides, we’ve got other stuff to do. 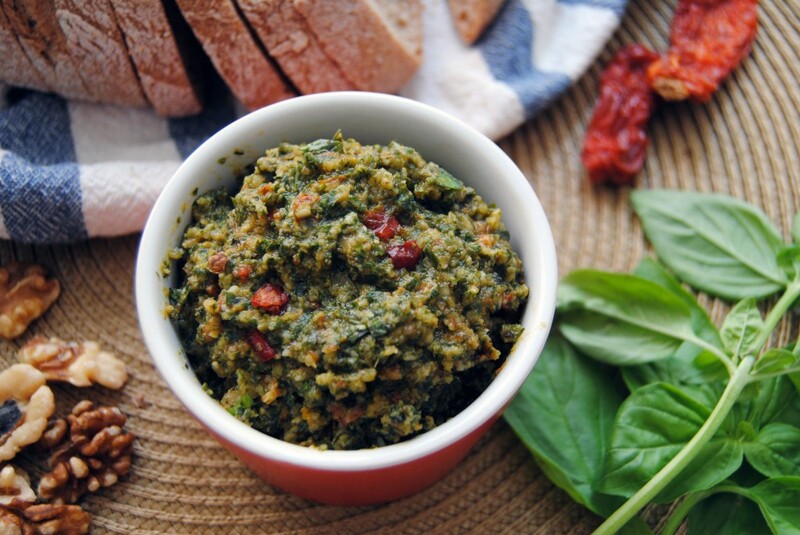 If you want to use this pesto as a pasta sauce (yum), there are a few alterations that can be made. First, I would chop everything more finely in the food processor to have a more even texture. Second, I would add a bit more olive oil. You should also reserve some of the pasta water in case the sauce needs a bit more liquid. The thing is, I rarely this as a pasta sauce, simply because I don’t eat that much pasta. So, I tend to use it as a spread or topping instead. It’s delicious on toasted bread or crackers, in an omelette or on top of scrambled eggs, and I’m sure it would be delicious in a sandwich or wrap. It looks beautiful on a platter with cheese, olives, and prosciutto (my dinner last night, by the way!). The key when making it as a spread is to avoid chopping the ingredients too finely. You want this to be nice and coarse with a lot of texture so you can taste the individual ingredients; especially the chewy sun-dried tomatoes and the nice, crunchy walnuts. Don’t worry too much about the measurements because no matter what, this will be good! A handful of this and a handful of that will do just fine. Add the basil, olive oil, chopped garlic and parmesan to a food processor and pulse a few times until coarsely chopped. This gives these ingredients a head start, because they can be more finely ground. Add the rest of the ingredients except salt and pepper, and pulse a few more times. Taste to see if it’s salty enough – I usually don’t need to add salt because the parmesan is already very salty, and pepper is entirely optional. So, if necessary, add salt and pepper to taste and pulse a few times to incorporate. Remember though, the chunkier the better! 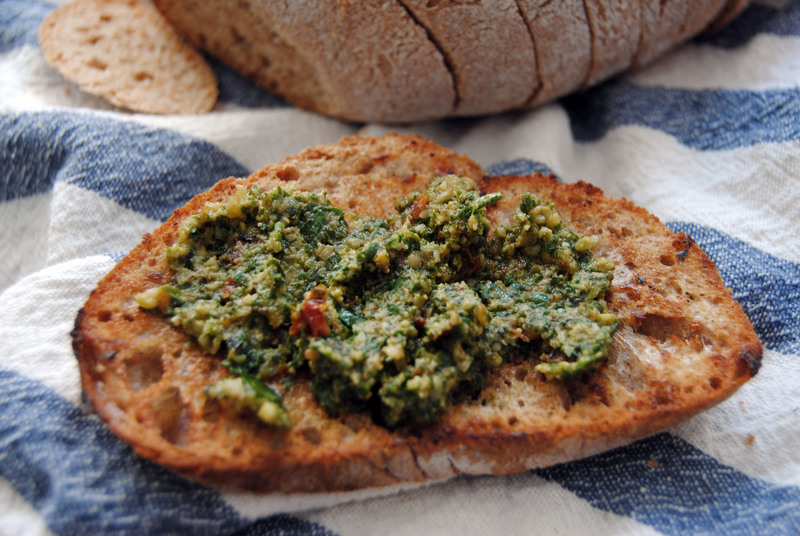 Enjoy this pesto with toasted bread or whole-grain crackers. 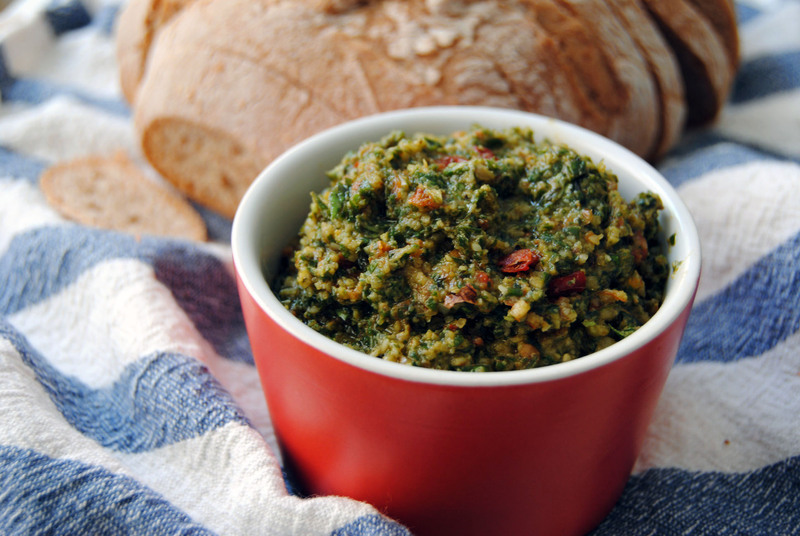 Your walnut pesto sounds great, I bet it’s wonderful tossed with pasta too. Yes, it’s wonderful on pasta too! I think you really can’t go wrong with this one.